You woke up this morning and it was sunny. A beautiful day for a walk! You start your trip and suddenly, you find yourself in the pouring rain without an umbrella. Such bad luck, you think! You run to find a place safe from the downpour, but you are already soaked. Then… after a few days you find you have a blocked nose and a little cough appears. It seems like our bodies are telling us that, even if we don´t notice it at first, something is happening within us and that has not been good for us. What are you talking about, Bea? I know…I know… Let me explain! The climate in Galápagos, like other parts of the world, is the result of consistent local weather patterns. Like our body, the ecosystem is adapted to those changes, being prepared for the usual season changes. But sometimes, this stability is broken by unusual weather, such as changes in the intensity of the winds and even the temperature of the ocean. The winds and water are in constant motion, traveling across the globe, cooling and heating land and water, dragging with them nutrients, living things and materials from one side to the other side of our planet. On the coast of South America, we usually find the Humboldt Current, a body of cold water that brings nutrients. A lower water temperature means a decrease in the levels of the water evaporation that cause rainfalls. What happens when El Niño appears? El Niño is a phenomenon that causes changes in ocean currents. What causes these changes? The trade winds that normally blow from the southern point of South America become weaker. This brings warm waters back to the coast of Souh America and cold to the coasts of Asia, causing many changes in the climate and ecosystem at sea and on land. Less oxygen in the water causes a decrease in the fish popullation and migration, affecting animals, people and other organism that feed on them. This is especially dangerous for animals at risk of extinction as sometimes their poplation may not be able to recover! Heavy rains cause flooding on land, which means social and natural impacts, destruction of nature and environments, homes and farmland. These changes cause a chain of consequences, even if we can´t see them at first. For example, when you forgot your umbrella, and your shoes and clothes got wet through, then, after a few days, you came down with a cold! In the natural environment there are effects observed only after a period of time. Many experts say that in recent years the intensity, of these phenomena has increased, perhaps connected to worsening impacts of climate change. We must do everything possible to act respecting the environment and reducing human impact on ecosystems around us. By Bea Mariño. Bea has a Master’s degree in Management of Sustainable Development and you can connect with her on LinkedIn. If you want to know more about the movement of currents and climate, click here. 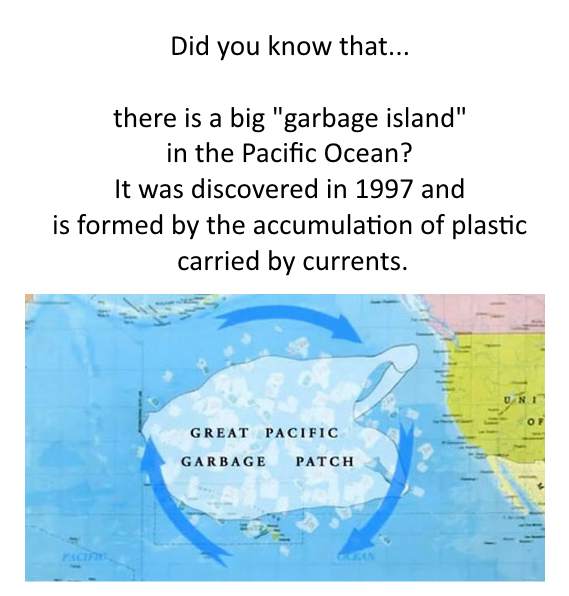 Watch a video on the island of floating garbage. If you want to know more about the phenomenon of El Niño and how it affects the Galapagos follow this link. Video summary of the phenomenon of El Niño. Categories: A Special Archipelago, Discovering Galapagos Updates, Galapagos Conservation.